On the 1st of September 1984, as a result of the reorganisation of Fareham's Secondary Schools, Fareham Park School became The Henry Cort Community College. Henry Cort was derived from the name of a man who was arguably the most distinguished person to be associated with Fareham's Industrial past. He was essentially a simple man whose visonary genius was exploited by others more cynical and worldly wise than himself. The son of a builder and brickmaker, Henry Cort was born in Lancaster in 1740. His links with Hampshire date from 1774, when his wife inherited business interests in the County, including Funtley ironworks, from her uncle, William Attwick. This gentleman also had a contract with Portsmouth Dockyard for the supply of mooring chains and other iron naval stores. Henry Cort made major improvements to the ironworks, to improve the quality of wrought iron, which in England was of poor quality at this time, and to find a way of producing it cheaply. The processes which he patented were for "rolling" (1783) and for "Fining" (or "puddling") (1784). These inventions proved enormously successful, and were quickly adopted all over the country. Soon the navy stipulated that all iron produced for their use had to meet Cort's standards, trials having proved it of superior quality to that available from other sources. Before Cort developed his processes, England imported massive quantities of wrought iron, mainly from Sweden and Russia. Within a decade of his patents, England became a major exporter of the product. Given that 1793 marked the start of the Napoleonic Wars, with its demands for large quantities of iron, and its problems in importing items from abroad, the significance of Henry Cort's work should not be underestimated. It can be argued that, but for what happened at Funtley ironworks in the early 1780s, the course of history could have been very different. The £1.6M project to revitalise Fareham’s town centre was inspired by Henry Cort. 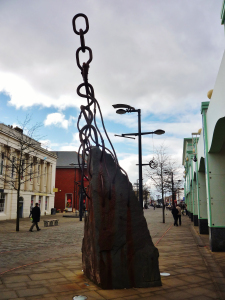 The scheme created a new tree-lined, pedestrian West Street, featuring specially crafted gateways and handmade metal street furniture; a bandstand in the town square with hand crafted metal work; and a new children's play area containing play sculptures by artist blacksmiths. 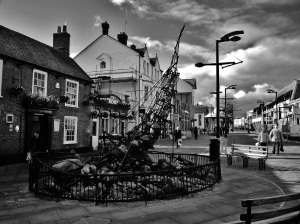 All the sculptures are constructed of wrought iron, as opposed to mild steel,making the Henry Cort Millennium Project the single largest exhibition of contemporary wrought iron in the country. View the Fareham town centre website for more information.